Mr. Deep asked me a really good question the other day. He asked, "are you thinking in rand yet?" Keep in mind the man is an accountant so this type of question is equivalent to him asking me the meaning of life. What he meant was, when I see prices in South African rand do I still convert the price to U.S. dollars in my head? And, do I have a sense of how much is reasonable to pay for something in rand? Because what I would be willing to pay for that same item in dollars isn't relevant. I think most of us can relate to being on vacation in another country, not bothering to really think about the currency, because it looks fake to us, handing a cashier a wad of money and hoping for the best. Or the worst example, going to some place like Disney World and getting that God awful bracelet that you can wave around and pay for anything and everything with. "Giant turkey legs for everyone on me!" Really fun until you get the bill. This strategy may work when you are on vacation (or not) but it's not a good way to live your life for three years. When you have lived in one country your whole life, you just know things. If you're from the U.S. You know how long a foot is, what 70 degrees feels like and how much is reasonable to pay for a loaf of bread. It's really just a feeling, a sense that you have for these things based on your experience. That sense is something I am trying to develop here because I don't think it's in my best interest to spend three years and be converting things to a dollars the entire time. Better to try to get comfortable with these scales and measurements. Here's how I first knew I was starting to think in rand. I went to a fancy - well more fancy than the supermarket where I usually shop - wine store. I told the woman working there I wanted a Pinotage which is a great South African red wine that you should run right out and try today. She immediately directed me to a really expensive bottle. I think it was like 280 rand or something. And I just knew the answer was no. I didn't convert it I just told her, no that's too expensive. But I knew I was starting to think in rand in my head, starting to know what was reasonable and what was not and starting to also know whether or not I wanted to pay that price for it. Progress! 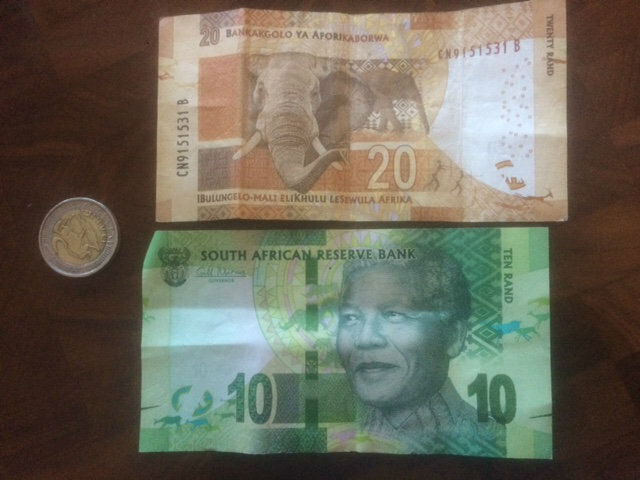 Some South African Currency. All the new bills have Mandela on the front and one of the big five game animals on the back. The coin is 5 Rand. 10 rand is the smallest bill available. Now, onto working on my knowledge of Celsius because reciting this rhyme (while cute) is not going to cut it for three years. Yep, I so remember when I finally "got" there too. Maybe earlier, because at the time we lived there, the Rand was 7-1, and calculating anything with 7s is just such a pain. Multiplying by 10 (or is it 12 now) is so much easier. BTW, I LOVE that little Celsius rhyme! I plan on staying forever when I move and I doubt that I would want to stop thinking in dollars. However I see your point on wine or anything else like that where thinking in dollars might cause you to overpay. In my view their currency fluctuates so much that it is hard to adequately adjust. Very pretty money though. We Americans have some of the dullest looking currency in the world. Celsius doesn't make sense to me. Thank God for conversion apps. If I ever end up internalizing metric I'll curl up and die.